List as of 7 June 2018. Spain joins a handful of countries where women hold at least half of ministerial portfolios. The new government of Spain includes 11 women ministers and five men in addition to Prime Minister Pedro Sanchez. After the announcement of the cabinet on 6 June 2018, Sanchez said it is the first time since Spain returned to a democratic system in the 1970s that there are more women minsters than men. Key ministries such as those of justice, economy, defense and education went to women. See more here. Fulfilling a campaign promise, President Emmanuel Macron named a gender-balanced cabinet in May 2017 with 11 of 22 posts taken by women. Women took on the portfolios of defense, justice and sports, among others – areas usually dominated by men. See more here. Sweden has the world’s first self-proclaimed feminist government and is the only other country, besides Spain, that has a majority of female ministers with 12 women and 11 men. See more here. Qualifying it as a “cabinet that looks like Canada,” Prime Minister Justin Trudeau formed in November 2015 a young and ethnically diverse cabinet with 15 women and 15 men who are mostly aged under 50. See more here. The global average for women holding ministerial positions is 18.3% (as of January 2017). 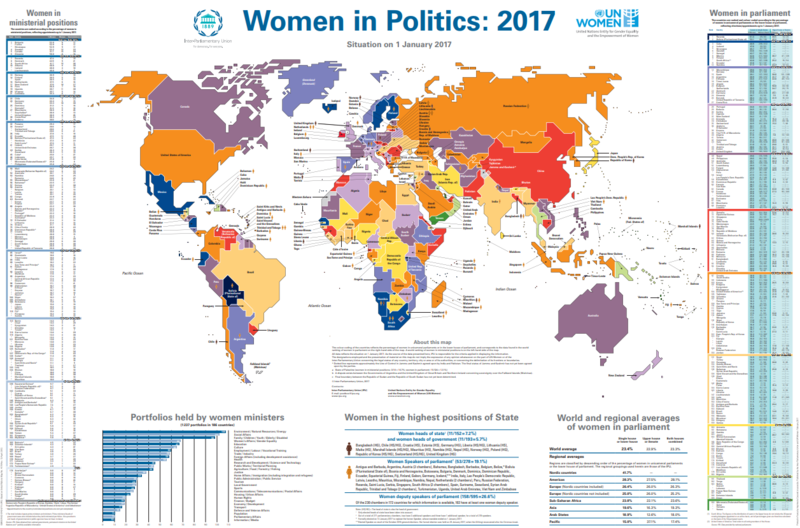 See UN Women and the Inter-parliamentary Union’s 2017 Map on Women in Politics for more information.